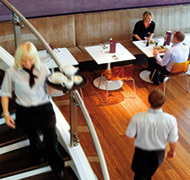 Gatwick Airport Lounges - Compare & Save. For just a small premium, you can reserve a seat at one of our exquisite Gatwick Airport Lounges, available at both the North and South departure halls. Relax and recharge for your flight ahead with complimentary snacks and drinks, comfortable seating, and friendly service. Pre-book online today! If you're departing from Gatwick Airport and have a few hours to kill, be sure to book your seat at one of our affordable, luxurious airport lounges. Available at both Gatwick North and South departure halls, you can escape the airport crowds, and recharge before continuing your journey. Reserve your seat in advance and you can benefit from even greater savings. Compare prices and see for yourself! Gatwick No.1 Lounge North: A modern lounge that is child friendly and offers additional facilities such as travel spa treatments. Opens early and closes late! Gatwick Ascot Lounge North: One of the more tranquil lounges in the North terminal. No children allowed so expect great relaxation in a quiet comfortable environment. Gatwick Wentworth Lounge North: A popular choice from ServisAir, this lounge is both child friendly and open most of the day. Expect complimentary refreshments, internet access and popular magazines & newspapers. Gatwick No.1 Lounge South: Children are welcome to this lounge where you can relax in peace with soft drinks, alcoholic beverages and other complimentary offerings. Believe us, it's called Number 1 for a reason. 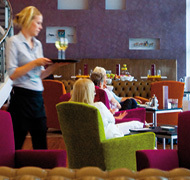 Gatwick Aspire Lounge South: The Aspire lounge is a quiet and comfortable offering from Servisair. You can expect a range of complimentary refreshments while you surf the Internet or read the newspapers/magazines. Children and infants are welcome. Airport Lounge Tip: To get more information about the airport lounge of your choice, simply click on the information tab in the quote results. 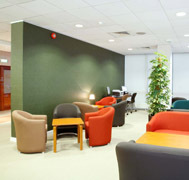 Here you'll find information on facilities and services as well as directions to the airport lounge at Gatwick Airport.